Tours • Public can check out the interior of net zero structure over the next week. Steve Griffin | The Salt Lake Tribune The public gets the first look at the new Public Safety Building in Salt Lake City during an open house Friday July 19, 2013. 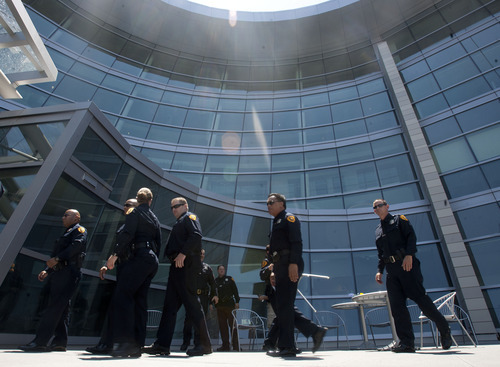 Steve Griffin | The Salt Lake Tribune The public gets the first look at the new Public Safety Building in Salt Lake City during an open house on Friday. 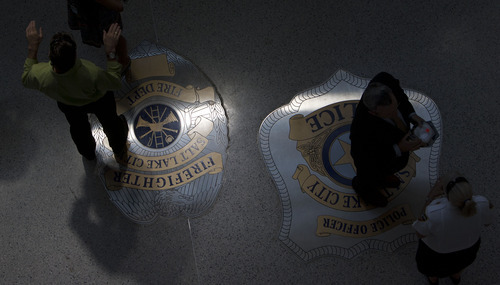 Steve Griffin | The Salt Lake Tribune Salt Lake City police officers walk up the exposed stairway inside the new Public Safety Building after a ribbon-cutting ceremony Friday July 19, 2013. Steve Griffin | The Salt Lake Tribune The public gets the first look at the new Public Safety Building in Salt Lake City during an open house Friday July 19, 2013. 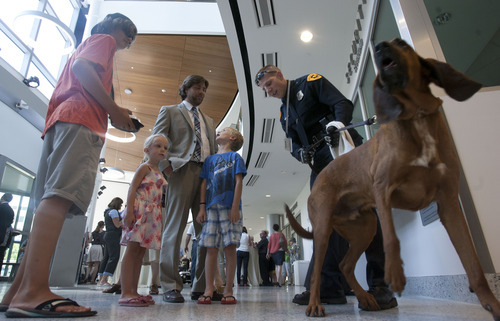 Steve Griffin | The Salt Lake Tribune Salt Lake City police officer Tyler Lowe and partner, Chase, a single-purpose tracking bloodhound, meet the public during an open house at the new Public Safety Building in Salt Lake City Friday July 19, 2013. 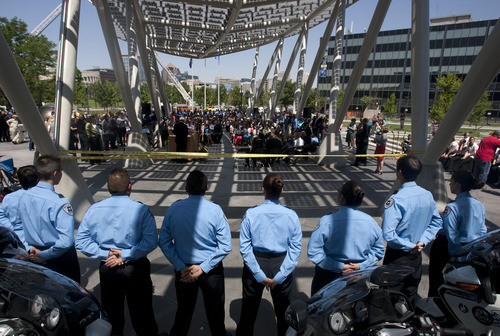 Steve Griffin | The Salt Lake Tribune Salt Lake City police officers enter the new Public Safety Building after a ribbon-cutting ceremony Friday July 19, 2013. 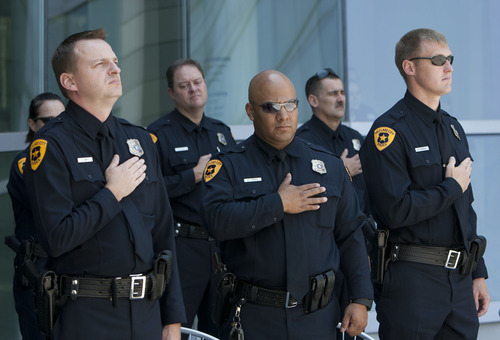 Steve Griffin | The Salt Lake Tribune Salt Lake City police officers put their hands over their hearts during the singing of the National Anthem during a ribbon-cutting ceremony officially opening the new Public Safety Building in Salt Lake City Friday July 19, 2013. Steve Griffin | The Salt Lake Tribune The public gets the first look at the new Public Safety Building in Salt Lake City during an open house Friday July 19, 2013. Steve Griffin | The Salt Lake Tribune The new Public Safety Building in Salt Lake City officially opened for business during a ribbon-cutting ceremony Friday July 19, 2013. 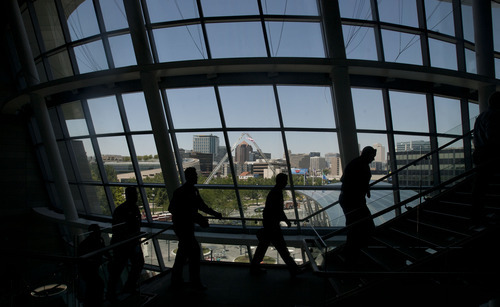 Steve Griffin | The Salt Lake Tribune The new Public Safety Building in Salt Lake City officially opened for business Friday July 19, 2013. Steve Griffin | The Salt Lake Tribune Salt Lake City firefighter Jason Buhelr delivers the giant scissors via zip line during a ribbon-cutting ceremony officially opening the new Public Safety Building in Salt Lake City Friday July 19, 2013. 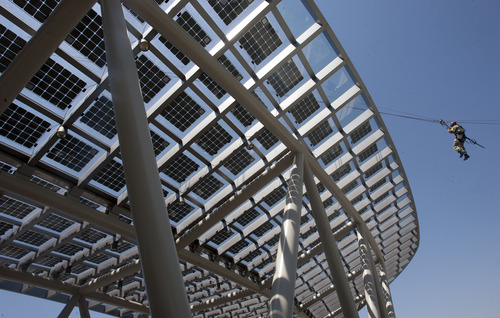 Paul Fraughton | Salt Lake Tribune The main walkway into the public safety building is covered with solar panels. Monday, July 1, 2013 Steve Griffin | The Salt Lake Tribune The public gets the first look at the new Public Safety Building in Salt Lake City during an open house Friday July 19, 2013. 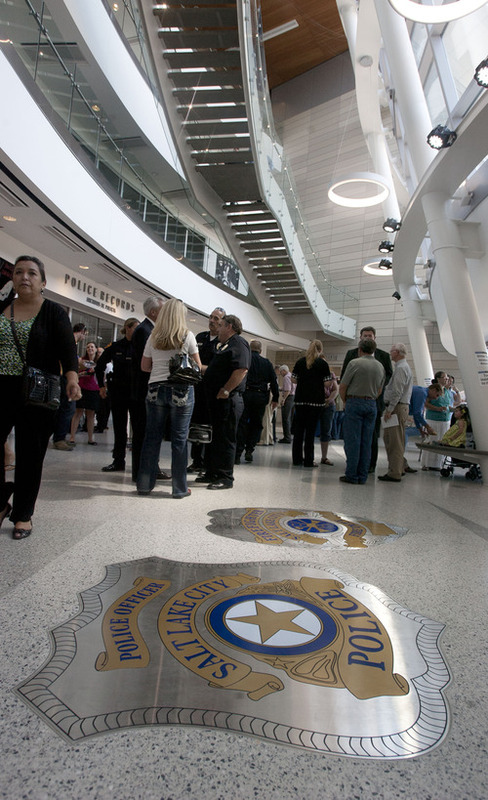 Steve Griffin | The Salt Lake Tribune Officials and onlookers celebrated the opening of Salt Lake City's new Public Safety Building on Friday. Steve Griffin | The Salt Lake Tribune The new Public Safety Building in Salt Lake City officially opened for business during a ribbon-cutting ceremony Friday July 19, 2013. 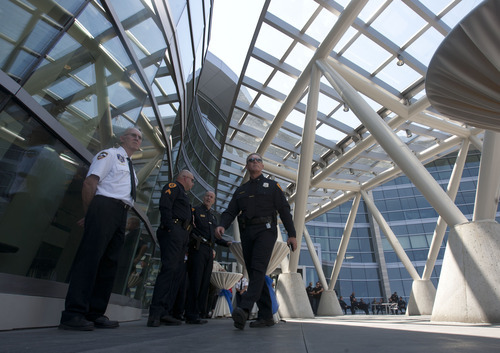 Officials and onlookers celebrated the opening of Salt Lake City&apos;s new Public Safety Building Friday with speeches, song and a fire fighter rappelling out of the sky. During a ribbon-cutting ceremony early Friday afternoon, Mayor Ralph Becker praised the glistening glass structure as an achievement for both voters and public safety personnel. The 175,480-square-foot building, located at 475 S. 300 East, is set to house nearly 400 police, fire and emergency dispatch employees and will replaced the previous public safety building, which Becker described Friday as "decrepit." 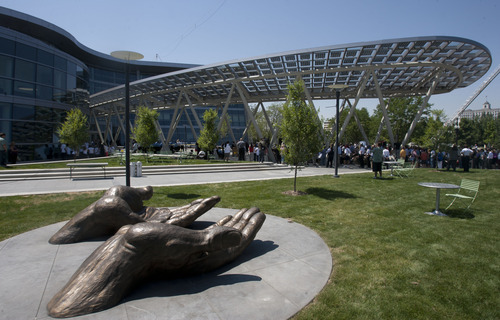 He added that the new building will stand the test of time and help Salt Lake City "lean forward into the arch of the possible and the beneficial." Becker also said Friday that the new building is the largest net zero building in the nation  a comment that drew loud applause  and should be certified LEED platinum. Other speakers included Police Chief Chris Burbank, Fire Chief Kurt Cook and other community leaders. Despite soaring temperatures, a large crowd of onlookers watched the speeches from the shelter of a long, curving canopy in the plaza at the front of the building. After about an hour, a pair of ropes dropped from the canopy and a fire fighter dropped to the ground with an oversized pair of scissors, which Becker used to cut a ribbon made of caution tape. Reaction to the building was generally positive. Ted Derby  a business development manager at LCG Facades, which installed the exterior glass panels  called the new building "beautiful." 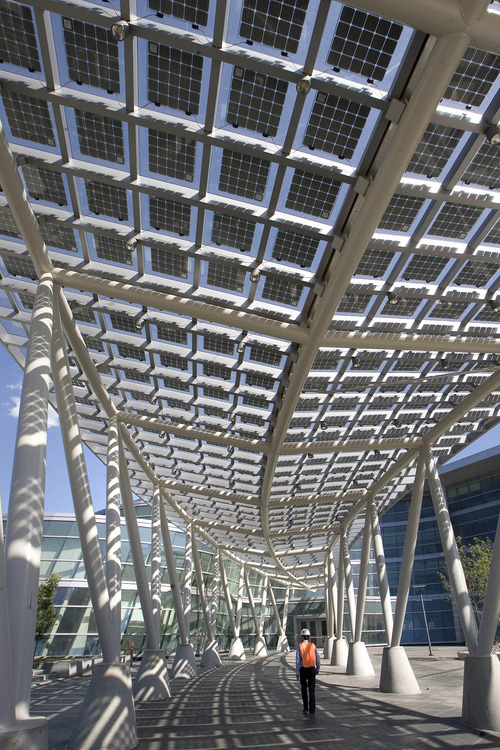 According to Derby, each of the panels had to be uniquely cut and shaped because the structure&apos;s exterior walls are angled in multiple directions. It was among the most complicated projects LCG Facades has worked on, Derby said, and some manufacturers turned down the job due to the difficulty. Jessica Patton brought her three children to see the building after learning about it in the media. 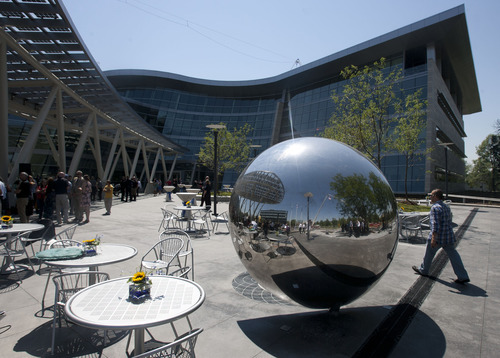 Patton said her family was interested in the architecture and technology used in the building, and added that it fits well in downtown Salt Lake City. "Visually, it pairs really well with the library," she said. 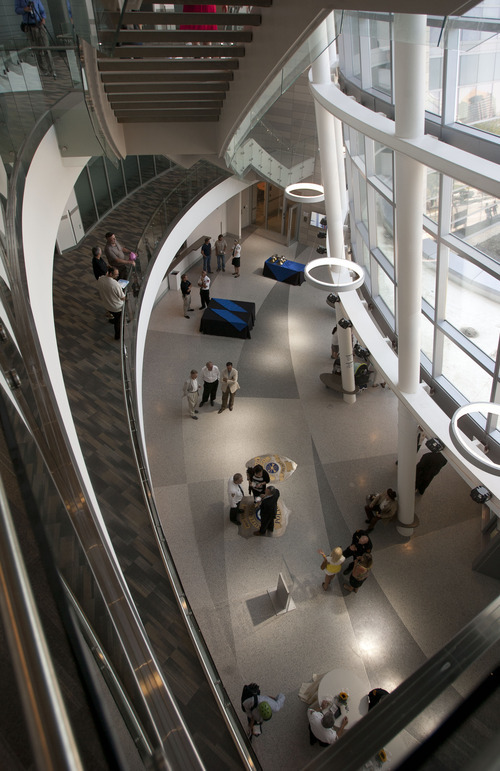 After the ribbon cutting, attendees were free to wander the halls and explore the building in semi-formal tours. During one of those tours, architect Hannah Vaugh, who did not work on the building, praised the decision to use a local firm to design the building. "There&apos;s a lot of local talent," she said as she wandered through a still-empty exercise room on the second floor. 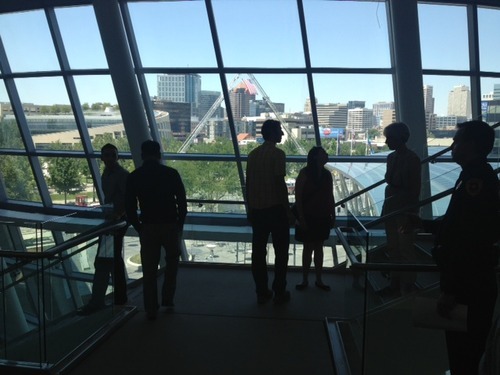 The building&apos;s grand opening continues through next week, with public tours most days through July 26. For more information, visit www.mocamanage.com/slcweb">http://www.mocamanage.com/slcweb. Saturday • 10 a.m. to 6 p.m.
Monday • 10 a.m. to 4 p.m.
Tuesday • 10 a.m. to 4 p.m.
Thursday • 10 a.m. to 4 p.m.
Friday • noon to 8 p.m.
Saturday, July 27 • 10 a.m. to 6 p.m.